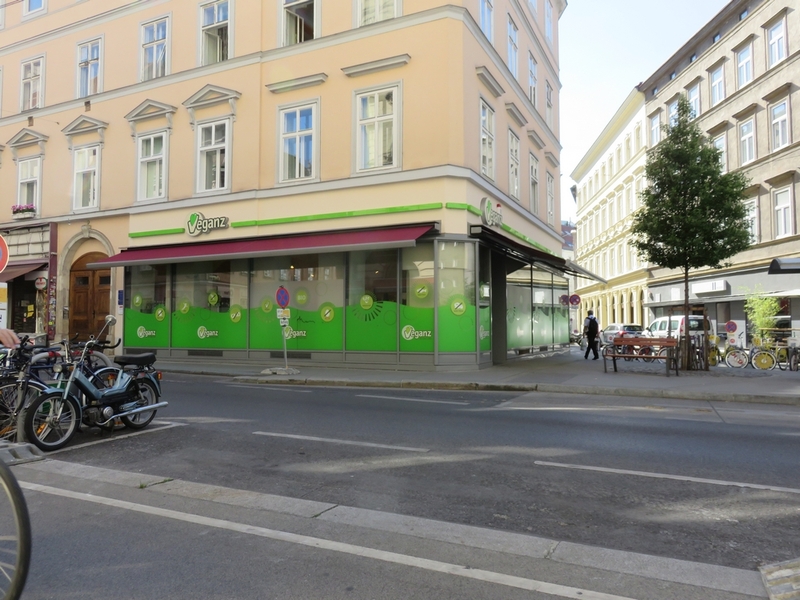 Veganz is about a 10 minute walk from the Opera (walk down south on the Operngasse and you walk stray up to it). We were also quite hungry (it was already afternoon and we hadn’t had any lunch), so we bought a drink, a wrap and sushi from the Vreshtogo fridge and ate them on the bench just outside of Veganz. Lovely! 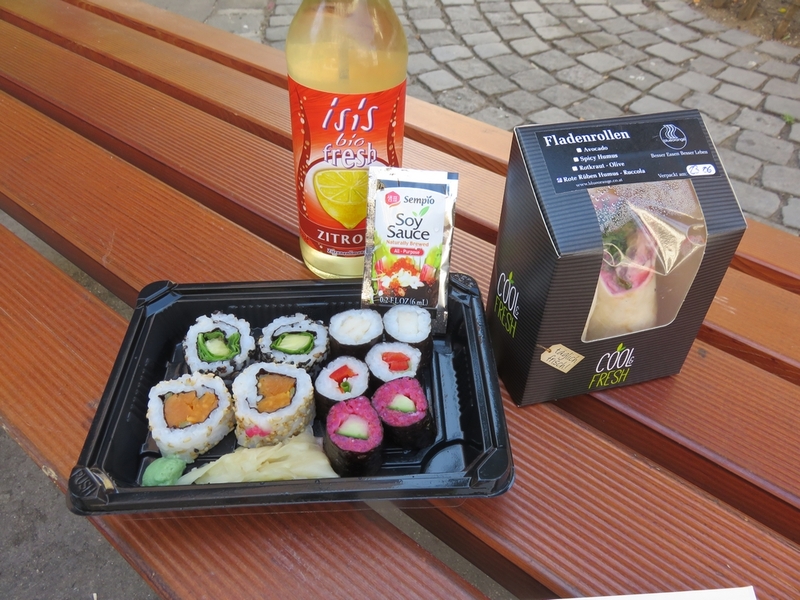 Our lunch from Veganz: sushi, wrap and apple juice, 12,86€. 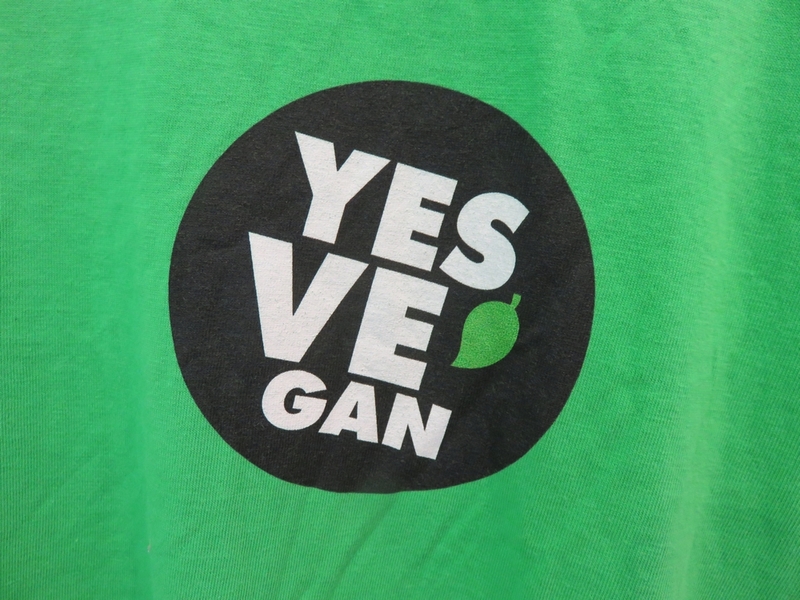 Veganz is sometimes referred to as a ‘supermarket’, which led me to expect a bigger store. It’s not as big as the supermarkets like Delhaize, Carrefour or even Bioplanet (BE) and Ekoplaza (NL). 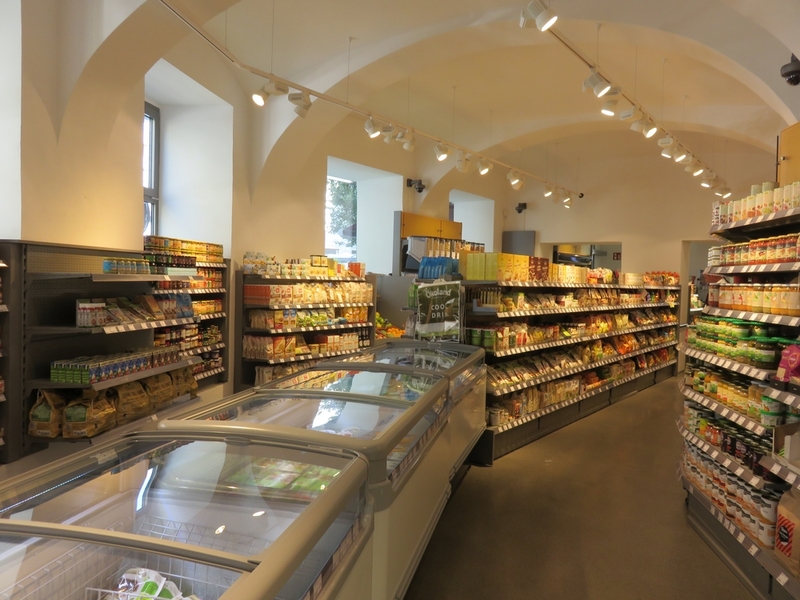 But Veganz is a reasonably sized store, comparable to the size of organic stores like Biovita and Origin’O in Belgium. 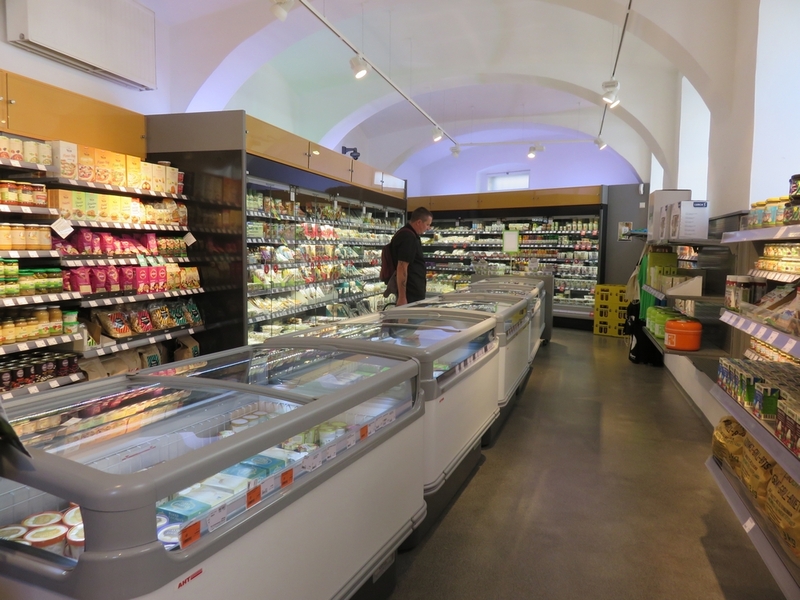 The main focus is on food: lots of fridges and freezers, and also a section with fresh vegetables. And of course lots of dried and canned things: jams, sauces, flours, cereals, grains, etc. Also sections with wines, cookbooks, and food for animal companions. There’s also a small section with cosmetics and body and care products (forgot to take a photo of this section!) 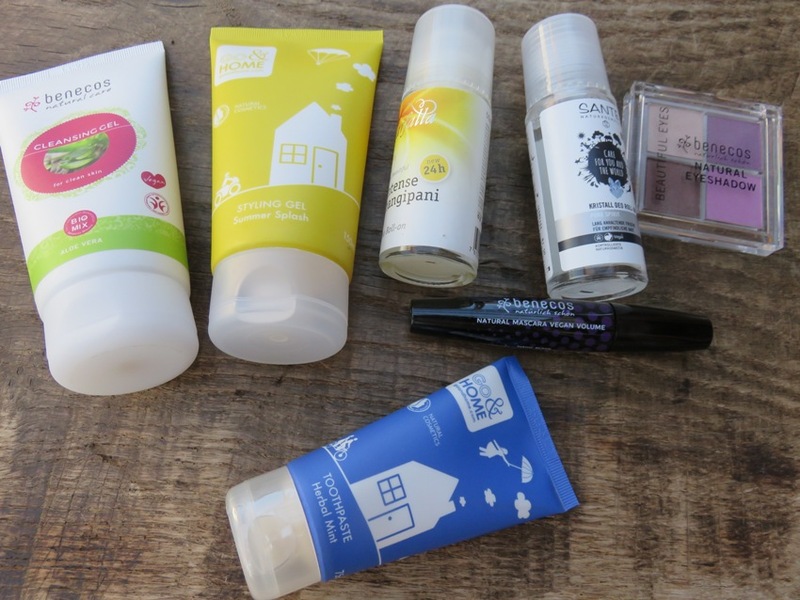 and I stocked up on toiletries and bought some makeup and sunscreen. We felt like kids in a candy store! It was such a reassuring and relaxing feeling to be able to shop without having to check labels to see whether any goods contain animal products (which seems to have become second nature 😉 ! It was also nice seeing a lot of brands that I had only seen mentioned online before. It was all very tempting, but we couldn’t carry any goods that needed cooling, and we were planning to visit some restaurants in Vienna in the following days. I would love it if they also opened a shop (or more than one!) in Belgium! Lovely review, thank you! If I wouldn’t live in Berlin (2 x Veganz) I would go straight away to vienna for the shopping. Oh my gosh- heaven indeed! What an incredible store. Thanks for the awesome review; I’ll know to look for one if I ever make it to Europe! thanks for dropping by Meghan! Hello foxeyedman, I looked into your website, great, I shared the video about gelatine. Thank you! Indeed a great site, and lovely drawings too! Aw this looks awesome! 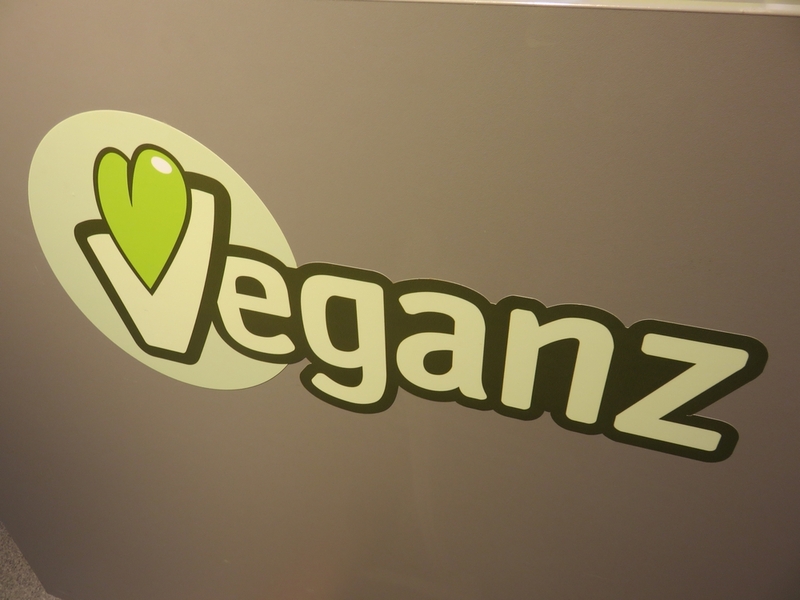 I was in the one in Berlin – wish I had a Veganz where I live! I wish we had this in Canada. I would be in HEAVEN! I can’t believe I missed this when I went to Vienna! It looks amazing.